The planet called Harmony had been settled by humans nearly forty million years before. The colony had been placed under the care of an artificial intelligence, called the Oversoul, high in orbit. This master computer had one overriding command: Guard the people of Harmony against the dangers that destroyed humankind on Earth and other worlds. But now the Oversoul was itself in danger. Its systems were failing. Soon, within a thousand years, catastrophic war would break out on Harmony unless the Oversoul could be repaired. The Oversoul determined that its core must be taken back to lost Earth, to interface with the Master Computer there, to be repaired and reprogrammed. But in order to do that, someone on Harmony must be given back the knowledge of space travel. And so the Oversoul must interfere directly with individuals on Harmony, in order to save the planet from disaster. And so, on the planet, while on the road to the city called Basilica, a man named Wetchik had a vision of destruction, sent by the Oversoul. Soon his sons, Elemak, Issib, Mebbekew and Nafai were drawn into conflict-with the city and with each other-as the Oversoul began destabilizing forty million years of social engineering. But even a master computer worshipped as a god can't guarantee that knowledge will be used only as it is intended. The Memory of Earth is the first of a new five book series that will carry its readers from the road to Basilica back to Lost Earth. 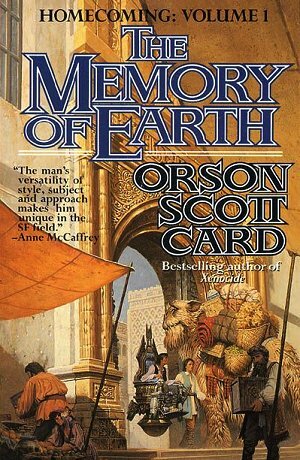 Orson Scott Card is the award winning author of ENDER'S GAME, SPEAKER FOR THE DEAD, and the bestselling XENOCIDE.